If you’re an aggregate worker who spends every day out in the field, you probably already know what applications most require the use of drums for trommel machines. But if you’re relatively new to the aggregate field, sometimes things can get a little bit confusing. Drums for trommel machines are used throughout the aggregate industry. Companies involved in land reclamation, for example, might use a portable trommel machine. They would use the trommel to separate out debris from usable topsoil. That way, they can resell recyclable waste, and use the topsoil for site work – saving them time and money. Aggregate workers find portable trommel machines cost-effective, because they can be brought directly to the jobsite, saving money on hauling and transportation costs. Because time is money, when it comes time to replace a drum for a trommel machine, whom you choose to manufacture your replacement screen makes a difference. How old is the current drum you’re using? 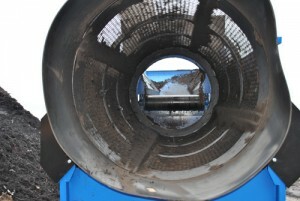 The wear and tear of daily use can cause the drum to break down and not screen accurately. What is the product you’re using the trommel for? If you’re making a shift from wetter materials to dry, you might want to consider a new drum for your trommel. Are there obvious signs of wear? Regular inspection of your drum will alert you to any issues like wear spots and holes. Are you changing the size of aggregates to be screened? The openings in screens are spaced according to the desired size of aggregate. If you need to produce either larger or smaller sized aggregate, you’ll want a drum that is sized accordingly. Are you working with a new portable trommel? You definitely will want a new drum for your new trommel. Sizing varies from manufacturer to manufacturer, so you’ll want to be sure you use an appropriately sized drum for the new machine. Samscreen’s drums for trommel machines are rated among the best in the industry. That’s because we offer precision manufacturing and top-of-the-line domestic raw materials. We know that no two machines – and no two aggregates – are exactly the same, so we work with you to provide a superior solution. And what’s more, we offer portable trommel drums for a wide variety of leading manufacturers, including such brands as McCloskey, Doppstadt and Powerscreen, to name a few. Visit this section of our site for a complete list of brand specifications. When you choose Samscreen to meet your trommel screen needs, you’ll benefit from the quickest turnaround in the business, which means you’ll be back up and running fast – all with a custom-engineered solution built to your specifications. If you need a replacement drum for your trommel machine, don’t wait – contact Samscreen today, and we’ll be happy to assist you.